As you know we can not download Android (APK) apps from Google Play to the computer without connecting the Android phone. But now you can download Android apps to your computer. Here I am going to show, how to download Android Applications to your computer without connecting the Android smartphone to the PC. This tutorial helps you to download app from Google Play and other Android Market direct to your Computer. By use of Mobogenie software you can download Android App to your computer even not connecting your Android smartphone to Computer. Follow the below steps to download android app to PC. In this way you can download android apps from Google Play to your Computer. For Downloaded Apps Go to C:\Documents and Settings\wangjihua\Local Settings\Application Data\Mobogenie\Download and open Apk Folder. 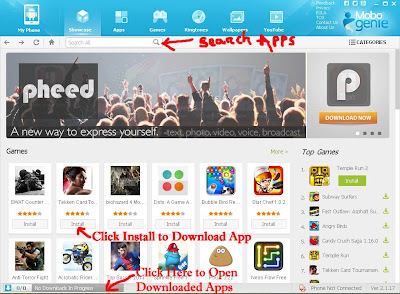 Download and enjoy android apps free to download it on your computer. In this process you do not need any plug-in to download android apps or neither need any tricks just simply download the android apps to PC.